NEW YORK–On a cold winter afternoon in midtown Manhattan, 30 people gathered outside Sen. Charles Schumer’s office to demand an extension to unemployment benefits and the creation of federal jobs. Congress still has not acted on legislation that would extend additional benefits for the jobless past the normal 26 weeks–some of the long-term unemployed have already been cut off, and around 2 million will lose this assistance by December 31 if the politicians don’t act. 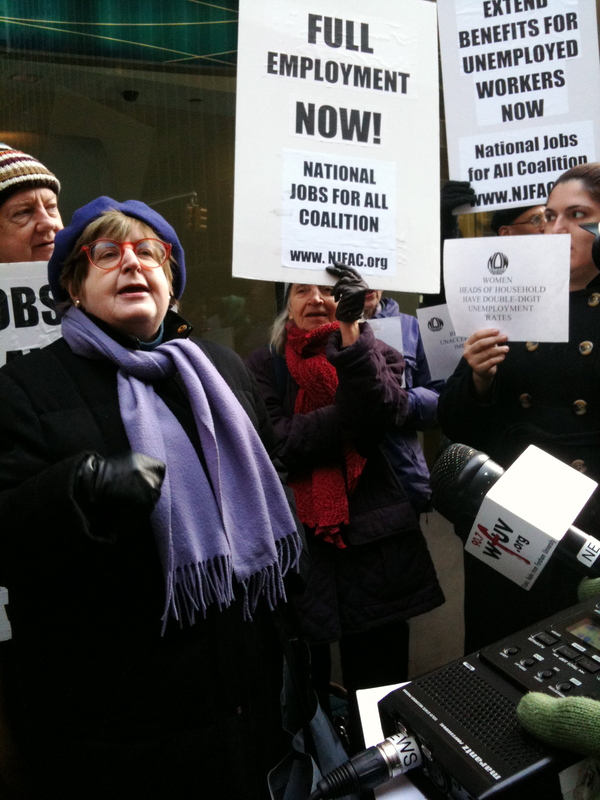 The National Jobs for All Coalition (NJFAC), an organization based in 10 cities, held its first Friday rally on December 3. This was one in a series of demonstrations that will be held throughout the country to bring attention to the impact of the recession on working-class people. The vigil included representatives from Communications Workers of America (CWA) Local 1180 and the National Organization of Women. Wall Street is expected to make $19 billion in profits for 2010, according to New York state officials–that would be its fourth most profitable year ever. Meanwhile, working class people are losing their jobs and unemployment benefits. Speakers at the rally denounced local and state austerity measures, and insisted that Barack Obama should create jobs with measures like the New Deal programs of the 1930s, instituted under Franklin Delano Roosevelt. A representative of the National Organization for Women agued that job creation should be toward racial minorities, women and others who have been disproportionately effected by unemployment. Participants at the rally called for well-paying jobs, good schools, new bridges and infrastructure, housing, taxing the rich and protection for government-sponsored entitlement programs. They want economically viable jobs that reflect current living standards. Working-class people have already been underpaid for the past 40 years, and this recent attack on unemployment benefits worsens their prospects. But Congress is prioritizing cutting the federal deficit over addressing working people’s concerns. Specifically, lawmakers propose to reduce spending on social programs, but have not proposed cutting the military budget or taxing the rich. According to the Bureau of Labor of Statistics, 15 million people are officially counted as unemployed. But this number, though already high, doesn’t reflect hidden unemployment–the 9 million people working part-time would can’t find full-time work, and the 6.2 million people who want jobs but have given up looking. Thus, the true number of underemployed is over 30 million. A recent report produced by the Roosevelt Institute titled “The Stagnating Labor Market” confirms how difficult it is for unemployed people to find new work–and that the number of people forced to work part-time because they can’t find full-time work has dramatically increased. And not only unemployment stop people from meeting their basic needs and those of their families, but it has adverse health effects, according to researchers for the Harvard School of Public Health. People who lose their jobs were more likely to get heart disease, diabetes and high blood pressure. And still Congress is dragging its feet on extending unemployment benefits. If lawmakers were really concerned about the deficit, they would eliminate the largest government expenditure–the U.S. military. Rather than waste tax dollars on occupying people in Iraq and Afghanistan, we should demand jobs for all.